For the second consecutive year, ExtraHop has been recognized as a Visionary in Gartner's Magic Quadrant for Network Performance Monitoring and Diagnostics (access the complimentary report). We've once again been placed furthest to the right for Completeness of Vision of any vendor in the quadrant; we've also moved further to the right year over year. Before I joined ExtraHop as CEO in 2016, I was the president of Fluke Networks (now part of Netscout). I've watched the rise of NPMD for years—and I've also seen innovation stagnate. The next big success story in NPMD will be the vendor who upends the category completely. And I believe ExtraHop is that company. Why? Because we're far more than an NPMD vendor. We don't just monitor network performance. We turn the network into the most comprehensive, real-time, scalable, and accurate source of answers about the performance and security of your hybrid enterprise. We See the Big Picture. The network now spans the data center, the cloud, and branch offices, yet legacy NPMD only sees what's in your data center. These limited solutions leave you vulnerable to performance disruptions and security threats while also failing to provide fast, clear analysis of the data you do have. Packet capture may be comprehensive, but at modern data center speeds it's also cumbersome, expensive, and impossible to scale. ExtraHop starts with analysis instead of packets, surfacing performance metrics across your entire enterprise in real time and delivering a 3-in-1 workflow that takes users from security threats and performance anomalies to the relevant packets in clicks, not hours. Machine learning cuts through the noise to keep IT and security teams focused on critical assets. The Trusted Source for Security Analytics. Network data is passive and observed; it can't be manipulated. Threats and vulnerabilities have nowhere to hide, so the ability to see into the East-West traffic within your data center is crucial. 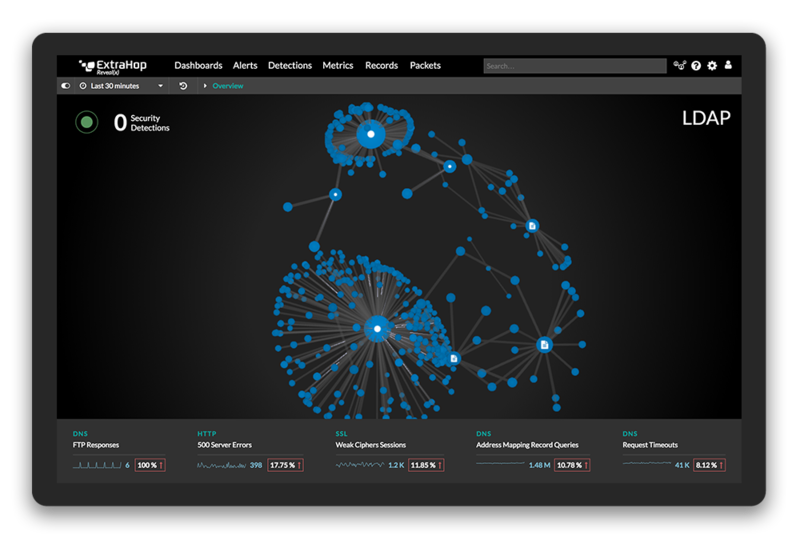 By analyzing all network interactions for abnormal behavior and identifying critical assets in the environment, ExtraHop focuses analysts' attention on the most important risks and streamlines response to limit exposure. Insight for the Hybrid Enterprise. ExtraHop has supported hybrid enterprise cloud initiatives for years. Since introducing performance monitoring for AWS in 2013, we've added ExtraHop for Azure and expanded our monitoring capabilities for cloud environments to include security. We also deliver a unified view across data center, cloud, and branch operations for our global customers. The Answers for Application Service Delivery. The network delivers the highest quality data, encompassing the entire application payload and every digital transaction that touches an organization. This data provides a window into every aspect of the application delivery chain, all the way through to end-user experience.